Ribbon metal leaf is manufactured by nazionale in Italy and is available in 50 meter and 75 meter master length rolls. The 50 meter(164 feet) master roll covers 82 sq. ft. and the 75 meter(246 feet) master roll covers 123 sq. ft. without waste or overlap. And width roll up to 152mm can be cut from master roll on special order. Available in Colour 2 1/2 (gold colour), add code/G, and Aluminum, add code /A. Wax used during the manufacturing process leaves a slight fim on the leaf. Therefore, a solvent based sealer is recommended. 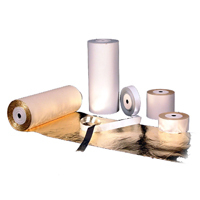 Copper leaf master rolls are 50 meters in length and cover approximately 82 sq. ft. without waste or overlap. Any width roll up to 152 mm can be cut from a master roll on special order.